Incorrect business information online is much more frequently encountered than correct business information online, and one of the main reasons for this is the way the business data flows through the ecosystem. 1) Business data is not transferred in real time. Normally, the data receivers are “fed” the data or they “pull” the data at certain time intervals. The latter are most frequently between 1 and 6 months long. This means that if certain business data has been updated in a business data provider’s database it might make its way to a data receiver (for instance, a GPS navigation system) no sooner than 1 month after it has been originally updated in the source. 2) Business data updated in the source is not always “mapped” to the old business data in the public platform. LocalEze is one of the most important business data providers in the US. They provide business information to a number of online platforms, one of which is MerchantCircle.com. Now Bob has a problem he doesn’t even suspect he has. The situation described above has one more negative side – because the record on LocalEze has been updated, it might be very difficult to track down the original source of the issue. There is no publicly available information about “Old Phone Numbers” related to the business record of Bob’s Painting on LocalEze. Therefore, a specialist, who Bob might decide to hire in future to help with his local SEO, might have a difficult, if not impossible, time trying to determine where all these incorrect listings on MerchantCircle.com and other sites originated from. The problem: none of these four sites is a direct data provider for Google. How to figure out the actual source? There are two official, recognized business data sources for the US for Google Maps – Acxiom, and Infogroup (ExpressUpdate) (see here for reference). The only place where Citysearch gets their business data from is Infogroup (see their FAQ for reference). These two listings are essentially part of the same network of business directories, so the data on the two of them is identical. Dr. Alexander Evan Jubb D.D.S. This page currently features the same business information for the business as the two listings on dental-yellow.com and dentists-directory.info. The NPI registry is one of the most trustworthy data sources in the medical industry, so the chances that this was the initial source of the bad data are very high. What is of particular interest is the fact that the NPI record was last updated on December 15, 2011, more than two and a half years ago, and there are still listings online that feature that outdated information. It’s easy to imagine a scenario where Infogroup might have picked up that information, added it to their database, the information spread across their network of “data receivers”, and then after the data had already gone out to their subscribers, Infogroup updated the record (they make 100,000 data verification phone calls per day), but the old information stuck on some of the receivers’ sites (as in my LocalEze – MerchantCircle example above). The last question left was – does Factual source data for practitioners from the NPI registry? Fortunately, Factual share statistics about their database of healthcare providers directly on their site. 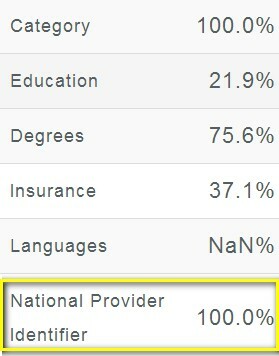 According to the stats there are only two “attributes” that are available in every single (100%) healthcare provider record – category, and National Provider Identifier (NPI). Boom! Since I know that Citysearch gets data from InfoGroup, this lead me to guess that there was a listing on Infogroup that might have featured the incorrect information, but had been updated at some point in the past on ExpressUpdate.com. And, if so, it’s possible that the data made its way to Google via Infogroup, which is an official data partner of Google. Where did Infogroup get the data from? Where did Factual get the data from? This lead me to believe that the information originally came from the NPI registry, but was updated not later than 15 December 2011 (as per the NPI registry log). Do Infogroup and Factual source data from the NPI registry? CONCLUSION: The data came to Factual (and probably InfoGroup) from the NPI registry! Phew! If you do NOT use Nyag or WhiteSpark for your own Citation work – then you just AIN’T an SEO practitioner….they both know Citations…and I recommend them both over and over and over AND I use them myownself! This stuff is possibly the most demoralizing aspect of Local SEO efforts. You go to bed thinking everything has been tidied only to wake up the next morning to what looks like random edits to your listings. It can be such a pain finding where the local data is coming from. Thanks for sharing these steps. I’m actually working on fixing NAP issues for one of my biggest clients, so this is incredibly helpful at the moment! Super post, Nyagoslav. It goes to show how citation cleanup involves the business owner on some steps; I’m pretty sure the misinformation on HIPAASpace can only be fixed by the doctor. Awesome detective work Nyago! Thanks for doing the extra leg work. I had discounted InfoGroup because the IG profile did not display the incorrect address (nor does the NPI profile), but it’s certainly possible that at one point it did. Unfortunately there’s no record in the Internet Archive. Extremely insightful and zero ambiguity. Phil, as far as I am concerned a HIPAA Space record can be updated only by the practitioner, or by a representative that is enlisted as a point of contact. In this case, and in many others, the help of the business owner (or at least a business representative) is imperative. I completely agree with you. Priceless information Nyagoslav, and great detective work! Having several clients in the medical field, I too suffer the wrath of bad NAP data. Knowing the root source of that information certainly makes our work easier. Working with clients that aren’t afraid of getting their hands dirty in the cleanup process is even nicer. Thank you! Now I have some calls to make to a couple clients to go in and update their NPPES information so I can synchronize it with their NPI profile. I didn’t see it mentioned but another issue is (atleast here in Austria) that a lot of the providers use very different ways to display phone numbers and other data. So you go and make sure every single citation is perfect but when they publish it they use their own variation like with country code or with brackets. Very nice article. Thanks to this article, we found lots of errors in our local listings.. Mind boggling. Its like standing on top of a building, cutting open a pillow, and then having to go and collect all of the feathers. This blog post breaks the myth about data flow in business. Unless read I would have never known how many mistakes I have made in business by taking data flow for granted. Nice read. I actually came across this as I was doing the research on getting NAP done properly on the web for my company. It is among the top I think important factor if you are dealing with local clients which is the case with us also. Once again thank you for the good info and looking forward to see more from you now. My head is spinning but this article answered my question of why we want to update or add a listing to Dexknows if ExpressUpdate already does it. And yes the local search ecosystem is more nuts that I ever imagined when you have these data aggregators pulling in information (correct and not correct) and then spit it all over the web.